The Arkansas Bassmasters High School Series State Championship Tournament was a two day fishing tournament held on Lake Ouachita April 14-15 for those teams who have competed in all Bassmaster High School tournaments during the season and qualified to participate. 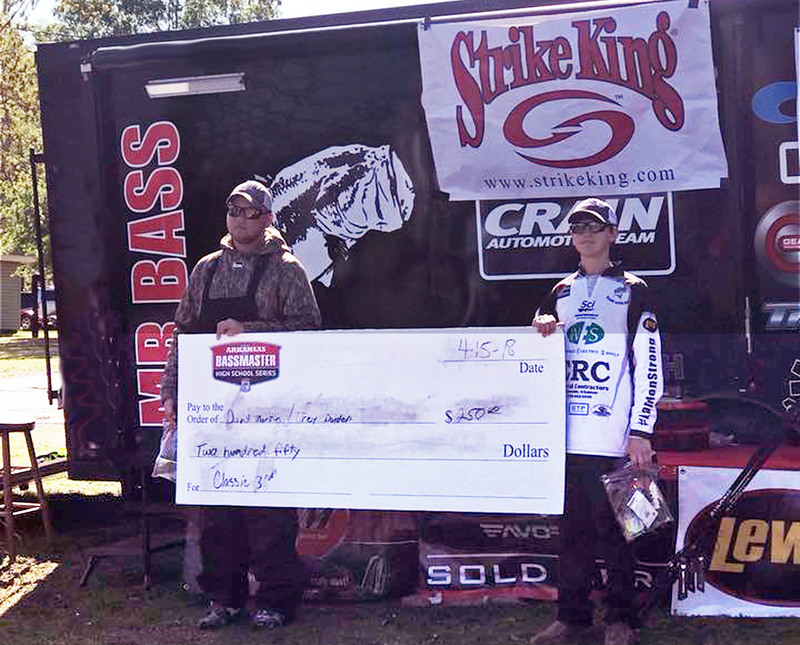 After the first day of competition, David Martin and Trey Darden, student-anglers on the Smackover High School Bass Fishing Team, were on top with their 5 fish limit totaling 17.26 pounds. There were 30 boats entered in the tournament from across the state. The second day proved more challenging for everyone with much colder temperatures and high winds. The Martin/Darden team caught 11.62 pounds for a 2 day total of 28.88 pounds and garnered them 3rd place overall in the Bassmasters High School State Championship receiving $250, Lew's reels and other prizes. JD Martin was the boat captain for the two student-anglers. David Martin is a Junior at Smackover High School and the son of JD Martin of Humble, Texas and Ashley McDaniel of El Dorado, Arkansas. Trey Darden is a freshman at Smackover High School and the son of John and Glenda Darden of El Dorado, Arkansas. Another Smackover High School student-angler team, who qualified to participate in the state championship was Ethan Warren and Robert Dixon. They also made a strong showing with a 2 day total of 18.42 pounds. Ethan Warren is a sophomore at Smackover High School and the son of Dwayne and Jana Warren of El Dorado, Arkansas. Robert Dixon is a junior at Smackover High School and the son of Becky Dixon of Smackover, Arkansas.